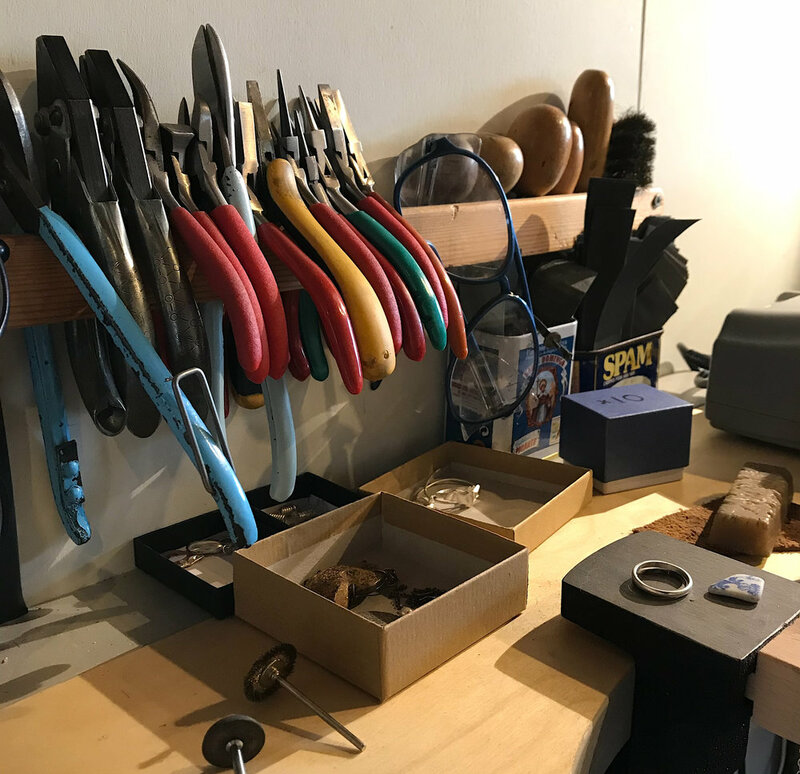 Spend the whole day in our beautiful garden studio, where Hannah will guide you through the process of making your own wedding rings from scratch. Each one-day workshop is per couple, so you will have the workshop to yourselves and will not have to share with anyone else. Hannah will be there to explain the process and to provide as much help as you need, but we encourage you to take control and do all the making yourselves! The day is fun, relaxed and informal and you will leave with rings you are both delighted with. All genders and sexual orientations are equally welcome! You can choose to make your rings from sterling silver, 9ct yellow gold, 9ct rose gold, 9ct white gold, 18ct yellow gold, 18ct rose gold, or 18ct white gold. You will experience annealing, shaping, soldering, filing, forming and finishing, and at the end of the day each of you will have finished hand-making a wedding ring from precious metal, and you'll be able to take them away with you on the day. Your workshop will run from 10am until 4pm, but may finish earlier or later depending on how you get on. Bookings are available seven days a week (please book early to avoid disappointment). We will provide morning coffee on arrival, a light homemade lunch, and a champagne afternoon tea once you have finished. The price per day per couple is £300, plus the cost of the metal of your choice. We are happy to provide quotes for your silver/gold in advance of booking, but please be aware that metal prices quoted are valid for one month from the date of the quote (this is due to fluctuations in the gold index price) so we may need to recalculate closer to the date of your workshop. We are fully insured and provide all safety and protective equipment. A champagne afternoon tea when you’re finished! Our homemade scones are always served with Cornish clotted cream, and either raspberry or strawberry jam. Our custom-built jewellery studio is in a beautiful rural location, with stunning views over open fields and wide skies to the moorland hills of the North Pennines beyond. by train The nearest station is Durham, which is on the main line from London to Edinburgh. Durham is approx 3 hours from London, and approx 1 hour 40 minutes from Edinburgh. Durham station is approximately 18 miles or 30 minutes' drive from our studio. You can book tickets on the LNER website. If you come on a weekend, we can normally collect you from Durham station. Please just let us know in advance. by air The nearest airport is Newcastle International, which is approx 33 miles or 50 minutes' drive from our studio. You can fly direct from many UK and worldwide destinations including London, Southampton, Exeter, Jersey, Dublin, Paris, Rome, Berlin, Brussels, Barcelona, Madrid, Toronto, New York, Los Angeles, San Francisco, Las Vegas, Chicago, Boston, Sydney... we're very accessible! Please check out Newcastle International's website for further details. If you come on a weekend, we can normally collect you from the airport. Please just let us know in advance. 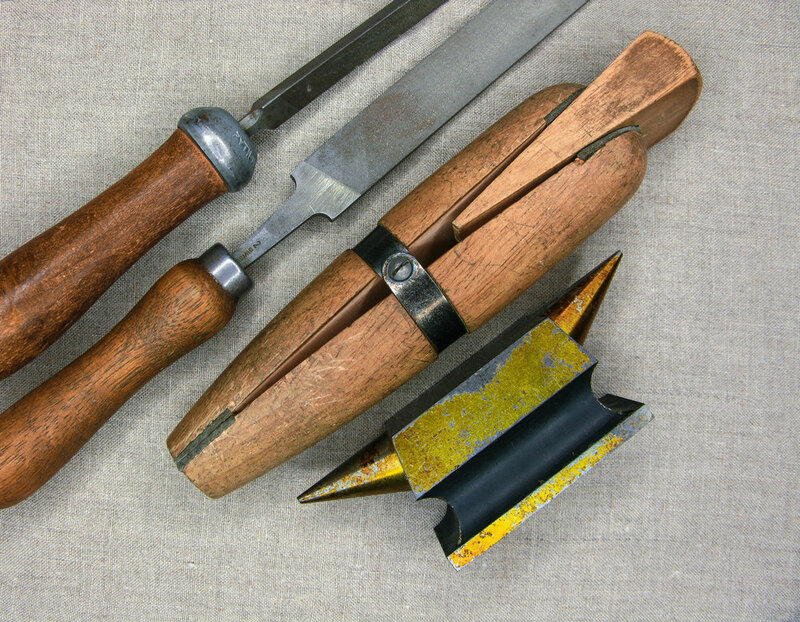 These are some of our workshop tools which you'll use; we're very well-equipped and have everything you need. Your choice of metal will be ordered in advance, so will be ready and waiting for you to work with when you arrive. Our delicious homemade lunches range from curries, chillies and soups, to sandwiches, pasta bakes, and salads. We cook according to the seasons and use homegrown, organic and local produce wherever possible.